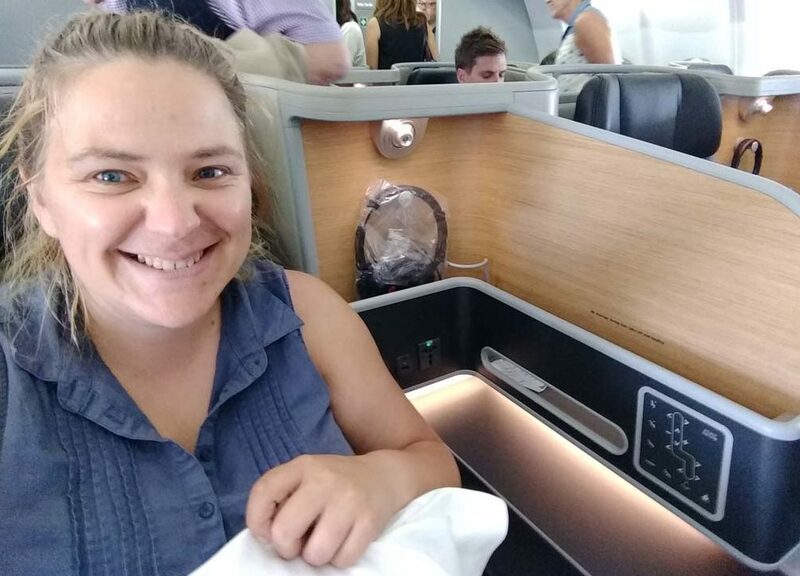 Home Experiences Air Travel Domestic business class in Australia – is it worth it? 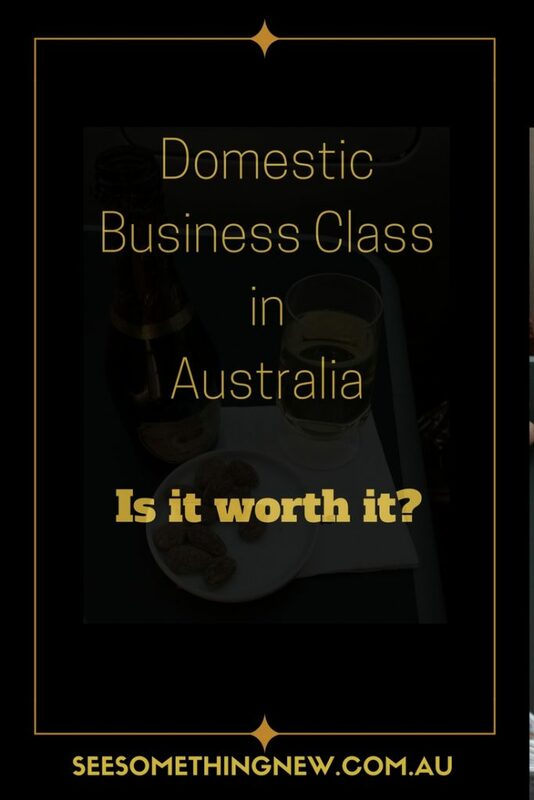 Domestic business class in Australia – is it worth it? My family and I have a regular argument over the value of using Qantas & Virgin points to upgrade to domestic Business Class in Australia. They all fall firmly in the ‘take the free economy flight category’ while I like to maximise my value for money and use my points to buy an experience I couldn’t otherwise afford. How many points does it ‘Cost’ to upgrade to business? What do I mean by maximise value for money? It’s very simple actually. Well sort of. Stay with me for a moment while I break it down for you. I paid 20,000 points to upgrade my Qantas flight between Perth and Melbourne from Economy* to Business. To book an economy ticket on the same flight is 18,000 points + $37 or if you want to book a guaranteed business ticket 36,000 points + $37. If you were going to pay money for these flights the economy ticket is around $300 and business fare on the same flight was around $2000. At the time of writing this, frequent flyers can request an upgrade on any non sale Qantas or Virgin DOMESTIC flight, unlike international where you need to book specific booking classes. So to summarise, a successful upgrade with points is $1700 worth of ‘value’ vs the $263 of value booking an economy rewards seat. Of course the age old argument of its not a bargain if you don’t need it could come into play. If like me, you would never be able to afford or justify paying cash for Business Class then upgrading may be a good option for you. Based on my experience with Qantas I think 20,000 points is a very cheap way to experience the luxury of domestic business class and definitely worth it! 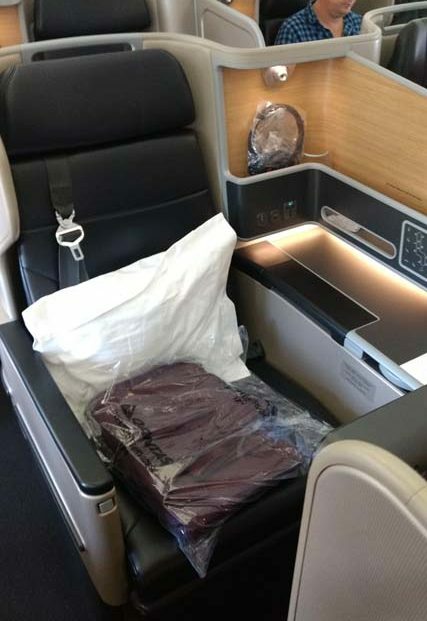 So what is the Qantas domestic business class experience like? 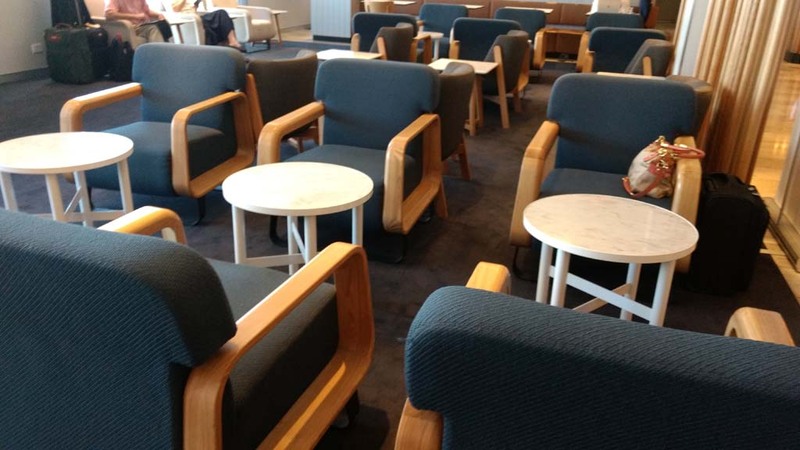 From the moment I arrived at the Perth airport I felt like I was being spoiled, with access to the Business Lounge which is another step up from the regular Qantas Club. If you’ve never been in a lounge before its a fun experience. There are comfortable seats instead of plastic chairs, power points for charging and free wifi for streaming, a distinct lack of loud children and all the food and drinks are free, including alcohol after midday! The barista made me an Iced Latte and coffee had never tasted so good after 4 weeks of instant up on a construction site! Once the bar opened at midday I had to celebrate my Business lounge access with a glass of sparkling. 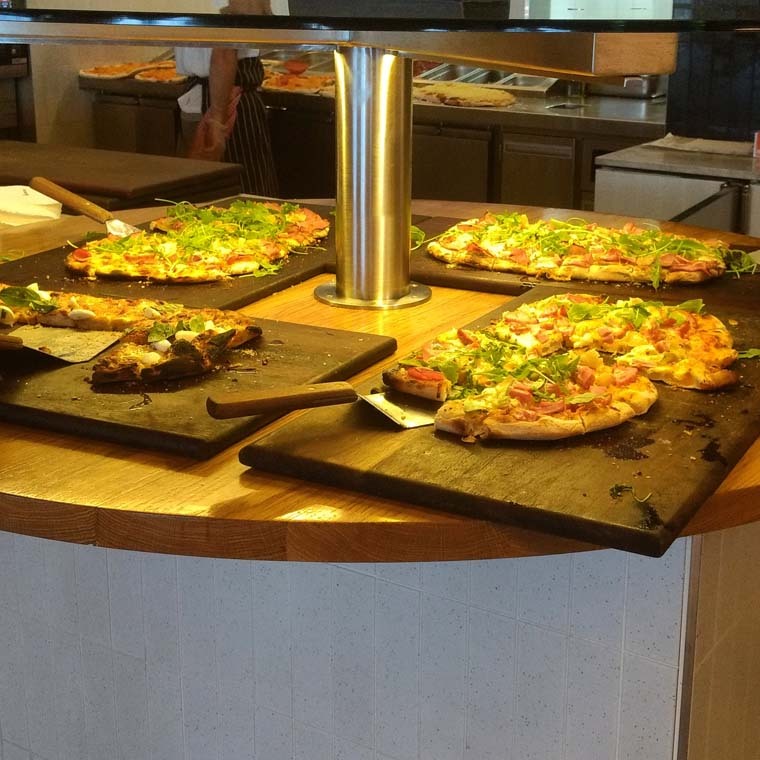 The fully stocked fresh salad, meat and fruit bar has loads of choice but make sure you save room for pizza! The choice of food was wider than the normal lounge, but I think the highlight for me had to be the fresh made pizza bar that popped up at lunch time – i regretted filling up on a toasted sandwhich but still managed to squeeze in a few slices! The fresh chef made pizza bar that popped up for lunch! I really lucked on this flight, getting one of the newly fitted Business Suites been introduced on the Qantas A330 East-West routes. It even has a full lie flat bed which would be very handy for getting some sleep when on the red eye. This suite was a big part of my experience feeling so luxurious and fun – I just had so much space and privacy. I’m not sure that a regular domestic business seat would feel quite as special! It also has 1 – 2 – 1 configuration so everyone in the cabin has access to the aisle without climbing past anyone else. Drinks are available as soon as the flight attendants can stand up. 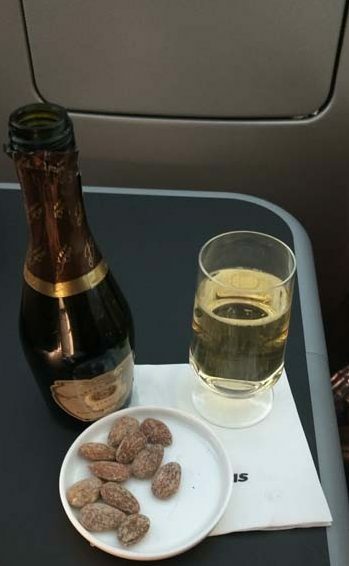 Of course Domestic Business Class wouldn’t be special without the fantastic service and the flight attendants in Business Class are clearly the Creme del le creme of employees. The flight attendant who looked after me was genuine and lovely from the moment she introduced herself personally at the start of the flight to when she farewelled me as I stepped off the plane. 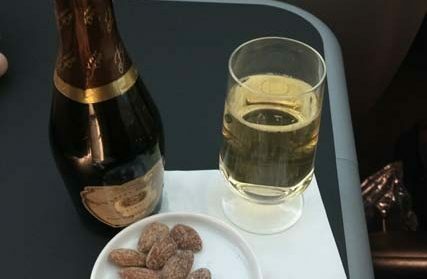 You are offered a beverage before take off and then the drinks service swiftly arrives once the seat belt sign is off. You can choose from a range of carefully chose Australian wines including sparkling, various spirits and desert wines. Dinner is 3 courses and served plastic free with real plates and knifes and forks. After the first two courses their is a range of desserts to enjoy and my personal favourite, cheese platters to nibble. And best of all you can do all of this while you watch your huge seat back tv screen. I was possibly the most content person on the plane with the combination of cheese, wine and David Attenboroughs ‘Earth 2’ series! Although the irony of flying business (the space of many economy seats) while watching a conservation documentary was not lost on me …but it was a one off treat. If documentaries aren’t your thing Qantas also has a good selection of new release tv shows and movies so you can kick back and take it all in. The biggest points waste I’ve ever spent was my only other business class upgrade which was on a qantas link flight from Perth to Broome on an old 717 about 5 years ago. All my points got me was a slightly bigger tattered old seat on a plane with no back of seat entertainment, barely any recline and worn padding. While the service was still fabulous and most of these planes are retired or soon to be or renovated there are still some poorly equipped planes out there. Always check the aircraft type before booking. Its a bit of a mucking around but you can check what the experience in Domestic business class will be like on each aircraft type with Virgin and Qantas or alternatively you can look up the seats on any flight through seat guru. Its also important to know that like most businesses, both Qantas and Virgin reward loyalty, so the higher your are up in their rewards program the more likely you are to get the upgrade. This does mean that the busier your flight, the less likely an upgrade if your not a frequent flyer so try and book on a quieter flight to maximise your upgrade chances. Also request your upgrade in advance so you get allocated a seat before other flyers try to upgrade at the airport. This is also important if you need a special meal as sometimes you will served your economy meal if its a very last minute upgrade (which mine was). Finally, you will get the best value from your upgrade on a longer flight where you can take advantage of the fancy meals and free drinks! 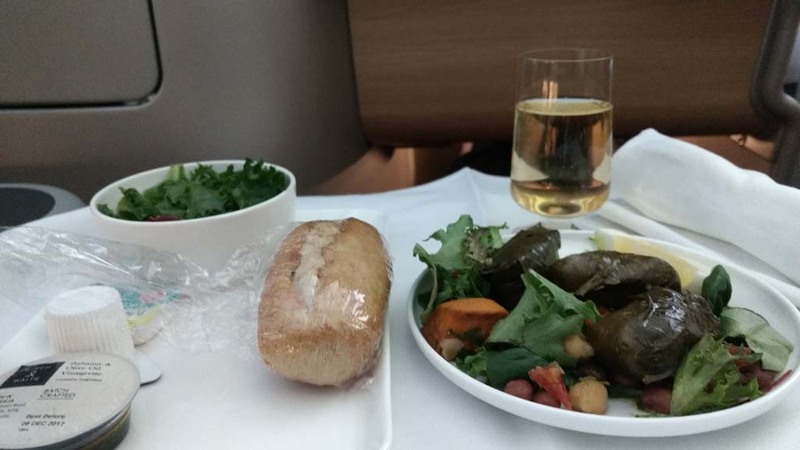 So is domestic business class worth it? Ultimately it comes down to this, if you can’t afford your holiday without booking a free rewards flights then its a no brainier, book the free flight. But if it’s not going to break the bank, a points upgrade is a very cheap way to spoil yourself rotten. An after all, isn’t escaping reality what a holiday is all about?! *Disclosure: My initial economy ticket was paid for by my employer at the time. Next articleIs Fitzroy Island Queenslands most relaxed island resort?